Late afternoon, I sit at my desk, just after class. 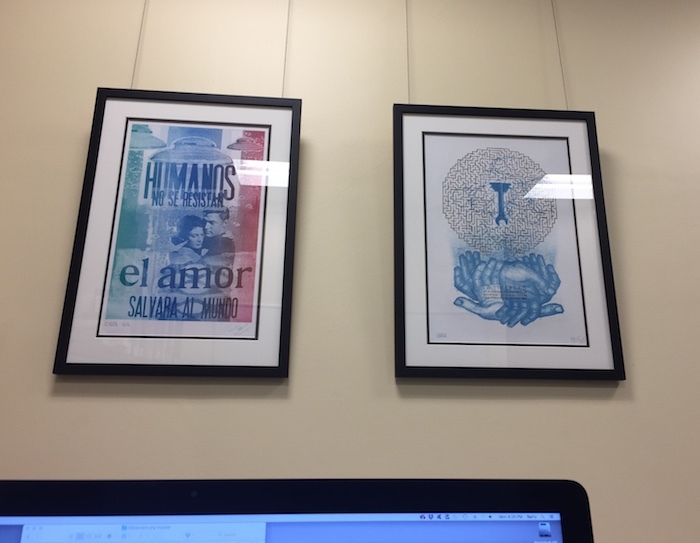 I glance up at the prints from Buenos Aires that hang on the wall in front of me. More than a decade ago I blogged so regularly. More free time in those days as I explored a premature semi-retirement in my early 40s. Yesterday, on my walk over the footbridge into campus, I thought about my eight-year old daughter and the thoughts that recur to me time and again: what will she know of my life, what will she know of what’s in my mind? Last week, I asked the students in my first-year composition course to take out a sheet of paper and to reflect for a few moments on a simple question: why write? It was a simple exercise, merely a prop to prompt their mental alertness at 8:30 in the morning. As a class we discussed their responses. People write because they have something to say. Writing is a way of thinking through a topic. Writing as a way of participating in a conversation. What is left out of the world if one doesn’t write? I feel haunted by that question. How even now I wish I could know more of my own child’s thoughts. Not the secret feelings found in a diary. No, not that. We all have, must have, thoughts that are merely our own. But those broader thoughts that form so much of who we are as a person. There is so much of myself hidden away. So much that will only be found in the expressions that I leave behind. The year is moving rapidly. Insects are vanishing. In February 1985, I was a 19-year-old freshman at Sewanee. I absolutely knew not what I was doing, though I had more focus as a freshman than as a senior a few years later. That was 34 years ago. And 34 years from now: 2053. My daughter will have turned 42, most likely without me. Environmental collapse, idiotic decision-makers, a gullible electorate, and a techno-system in overdrive might present a world unrecognizable to us now. The future depends upon the reasonably intelligent and not merely the skilled. I work at a liberal arts college with an identity crisis. (I’m borrowing that phrase from an actual student at this college.) My work, in essence, is to aid others in creating their own future. Here’s the question: how can the liberal arts provide context for their creativity, for their career ambitions, for the lives they seek? I have this immense inner need to feel like I am doing something with my life. (Perhaps that’s a cause of suffering, the Buddha would say.) And I am doing a lot. I’m actually remarkably happy with my life’s work, what I have accomplished and where I’m heading. Yet, with all that I do, I must remind myself that I need to capture it in words in a regular basis. If not, an unfulfilled feeling creeps into heart and stays around. That impulse to write, that impulse for creativity, nudges me only to be suppressed by piles of papers to grade, lessons to plan, meetings to attend, and job descriptions to revise. And there’s the key: channeling my work into my creativity, into my writing. It’s always been there. I just need to unlock that door that reveals the purpose of doing.